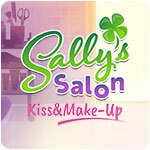 Sally's Salon: Kiss and Make-Up Game - Download and Play Free Version! Hi, Francois here... Let me take you on a journey. And trust me, it will be a journey to remember! It all started a few months ago... Sally and I were happy in her salon. Being beauticians, making girls pretty... business was booming! That all changed when her 'best friend' (hah!) April came around, offering Sally a 'chance of a lifetime'. Sally, bless her, chooses only to see the good in people, and actually listened to April. 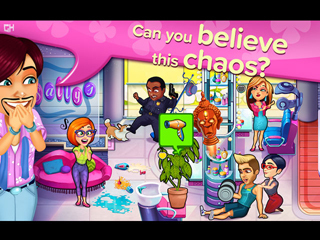 Next thing you know, she's sold her salon and used all her savings to become co-owner of Happyville, a luxurious spa. And that's when the real chaos started... April is fixated on earning a Mirage star for the spa and is willing to do anything - and everything - to get one! Sally doggedly insists April isn't as bad as she looks. I'm sorry, but if it looks like a snake and slithers like a snake, well... Of course, that's just MY opinion! Please, come help me talk some sense into Sally. With your help, I'm sure it will be okay in the end!